Roasted Butternut Squash with leeks, bacon and a smoky-sweet apple glaze that brings these wonderful fall flavors together. 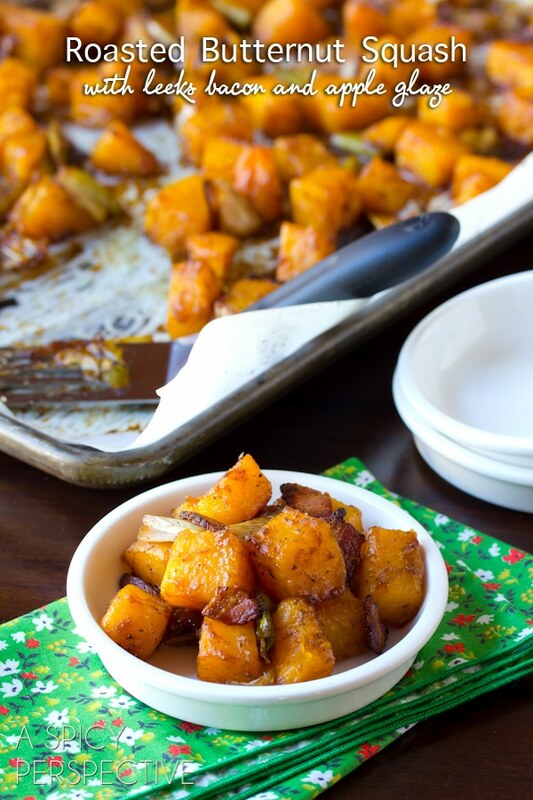 This seasonal side dish is ready to take center stage on your table! As I ponder the meaning of Thanksgiving this year, a million complexities whirl through my head. How more times than not, what brings us to a place of gratitude are the tough times in life, providing a clear view of what’s truly important. How I’m thankful for the lessons learned in the school of hard-knocks, yet hoping I’ve earned my doctorate and never have to return for continuing ed. How good I really do have it. Healthy relationships, Healthy body, Healthy mind. What more could I ask for? With Thanksgiving approaching, I am acutely aware of all the aspects of my life that deserve a word of thanks. My family has been through the ringer over the last couple years, but we have emerged stronger, wiser, and hopefully full of grace and forgiveness. For me, Thanksgiving is a time of contemplation. I look at my kids and pay attention to their sweet smiles and gentle spirits, instead of their pesky little habits. I look and my husband and thank God for his loyalty and friendship, instead of obsessing over the stained shorts he won’t throw away. I look at myself with a grateful heart at how far I’ve come, forgiving my short comings, so I can live without internal turmoil. Thanksgiving is a time to see things with a different set of eyes. I encourage you this year, to cut yourself a break on the over-the-top has-to-be-perfect dinner. Focus on a few key dishes, and kick the rest to the curb. That way you can use your energy to pay attention to what’s really important in your life, the people around you. I’m sure you’ll find most of your thoughts of gratitude center around your loved ones. Speaking of simple, this smoky-sweet Roasted Butternut Squash would make a fabulous simple side dish for your Thanksgiving table. I roasted the butternut squash and leeks in a little bacon grease, then whipped up an easy and flavorful apple glaze using Musselman’s Apple Butter, honey, red wine vinegar, and a little spice. The rich apple butter, coriander and touch of chipotle pepper made the roasted butternut squash and leeks burst with flavor. My family Oooed and Ahhhed over this one… just one more thing to be thankful for! Preheat the oven to 400 degrees F and line a large rimmed baking sheet with foil or parchment paper. Place a skillet over medium heat and cook the bacon, until crisp. Remove the bacon with a slotted spoon and reserve the bacon grease. 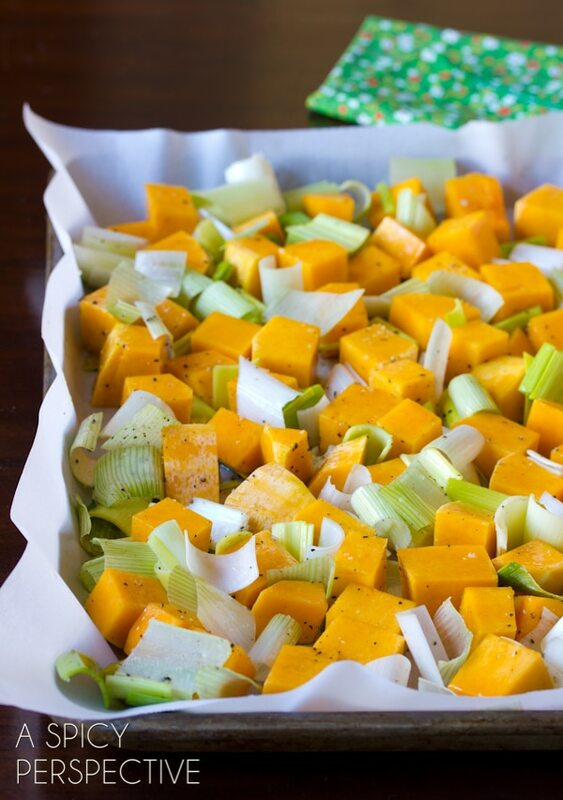 Place the chopped butternut squash and leeks on the lined baking sheet. Drizzle the bacon grease over the top and toss to coat. Spread the butternut squash and leeks out into a single layer, then sprinkle with salt and pepper and roast in the oven for 30 minutes. 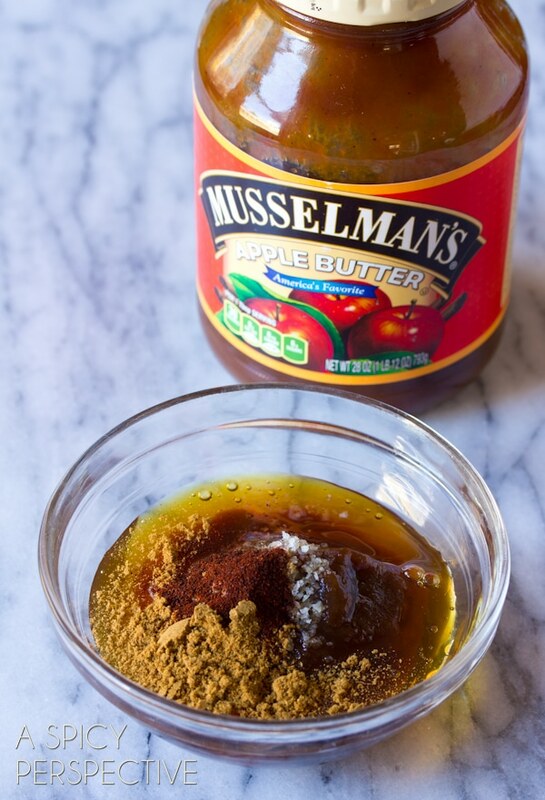 Meanwhile whisk the Musselman’s Apple Butter, honey, vinegar, salt and spices together. After 30 minutes drizzle the apple glaze over the vegetables and toss to coat. Spread the vegetables out again and roast for another 20 minutes. Sprinkle the cooked bacon over the top and serve warm. OMG This looks sooo good! I really like the sound of the apple glaze on the butternut! That apple glaze is wonderful, I love apples and squash together! I’m dying over the apple butter and leeks in this. So good! Great words of wisdom Sommer! I could eat this whole pan of squash all by myself! 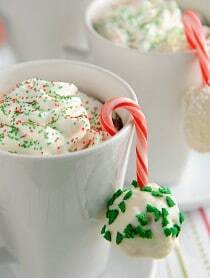 That looks so awesome good. I bet it smelled wonderful in the oven, too! Leeks, bacon, apple butter, chipotle chili – this is crazy delicious, Sommer!! Amen, sista! Simple is always the better way to go! And let’s start with this butternut squash! 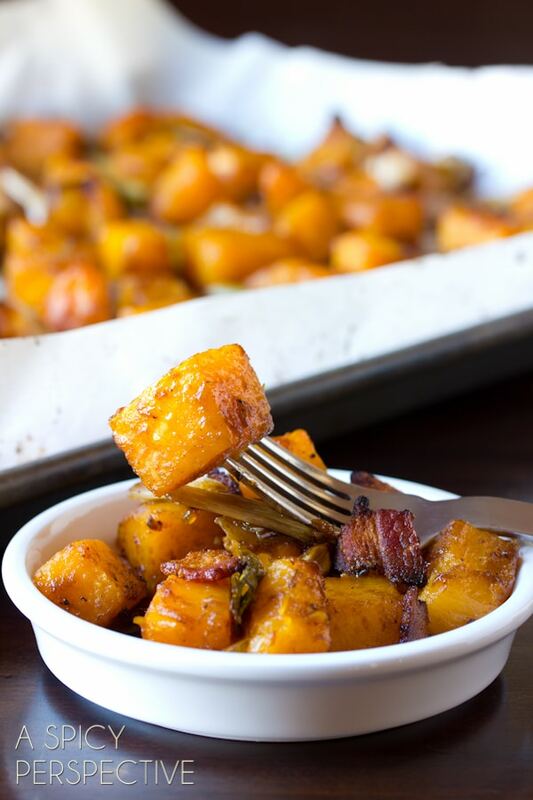 I love roasted butternut squash, fab flavors! Oh Sommer, this just looks like the most scrumptious side for Thanksgiving (or any fall meal). Absolutely lovely, and great flavor combos! I have a butternut squash in my frig right now and have been trying to think of a creative way to prepare it. 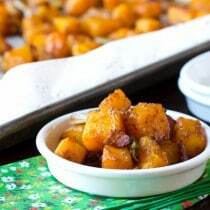 This roasted butternut squash recipe sounds perfect and something I think my husband is really going to like. Thanks. 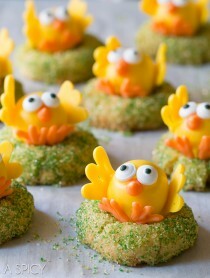 An absolutely lovely post and equally lovely recipe. Just beautiful, Sommer. The apple butter is such a great idea! Oh my gosh!! 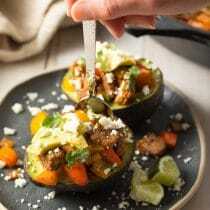 This glaze and the roasted butternut squash! Love it, Sommer!! Looks absolutely delicious, Sommer! Perfect for holiday entertaining. I’m with you Sommer – simple is best, and spending time with those you love and who you’re so thankful to have in your life is the best part of the holiday. I’m such a fan of roasted butternut squash. I love this glaze, too. Great twist! Sounds fabulous paired with bacon. I have some homemade apple butter on hand too! 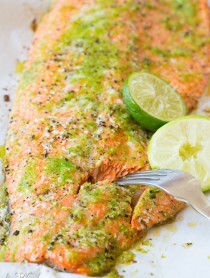 this is the prettiest dish with such wonderful flavors!! I love this recipe, and I love your reflections… So true, it’s the toughest times in life which have led me to be more grateful, too. Thank you for sharing! 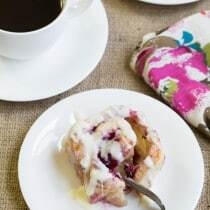 Love the glaze in your recipe – sweet and spicy! I want to eat the entire pan! Sommer, I couldn’t agree more with your words of wisdom. 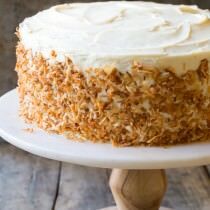 This looks like the perfect dish for Thanksgiving; simple, yet unique. Have a wonderful Thanksgiving. 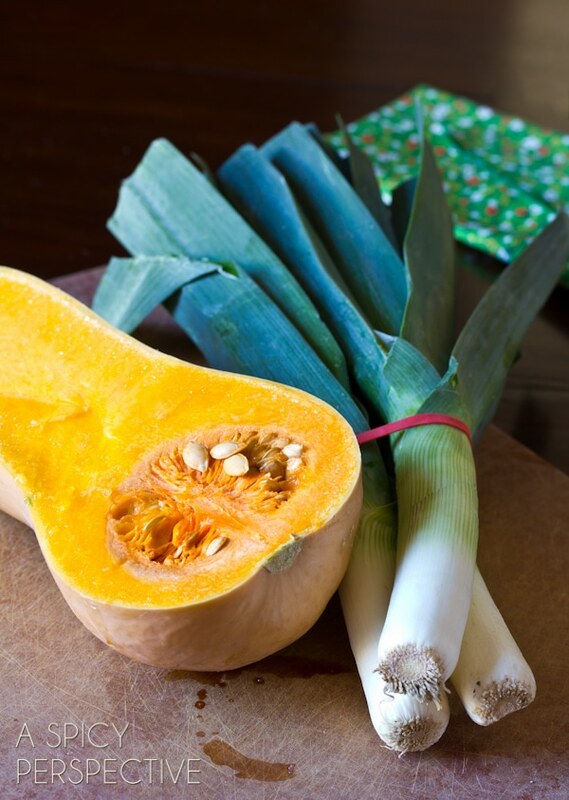 I love the smoky-sweet flavor too this squash! 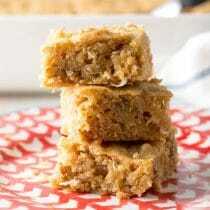 That sounds so good and using apple butter to achieve the sweet is such a great idea!